The ability to cut quickly and accurately without the need to use costly premixed gases, including cutting bolt holes free from edge taper. SAI’s cutting machine offers a cutting width of 8 ft. The gantry carrying the cutting head rides on track that allows for a maximum plate length of 21 ft., with the option to add track as needed. Cutting speed ranges from 30 to 200 in./min., with a rapid-traverse speed of 1000 in./min. A zoned downdraft table takes care of fume exhaust. “With the high-definition plasma system (a 525-A Komatsu Twister machine) we’re getting squarer, cleaner cuts, and truly round holes, making it easier for our teams in the field to assemble the parts,” says SAI president Kim Corcoran. SAI designs, fabricates and installs bulk material-handling systems for processors of grain, flour, food and similar products. 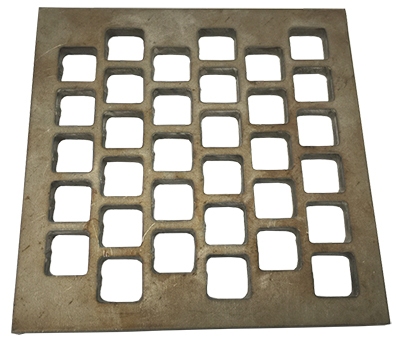 Ingredients in its fabricated-metal-products product mix, all cut, formed and welded in a 30,000-sq.-ft. shop in Burrton, KS, include mild- and stainless-steel sheet and plate from 18 gauge to 3 in. thick. Santiago points to specific machine characteristics that allow him and operator Scott Mussman to achieve just that. Most notably: the fact that the Komatsu machine mixes plasma gases at the cutting head rather than downstream at the source. That makes gas purging between setups extremely quick and efficient, so that changeovers take a mere 3 to 5 min., says Mussman. SAI’s cutting machine offers a cutting width of 8 ft. The gantry carrying the cutting head rides on track that allows for a maximum plate length of 21 ft., with the option to add track as needed down the road. Cutting speed ranges from 30 to 200 in./min., with a rapid-traverse speed of 1000 in./min. A zoned downdraft table takes care of fume exhaust. And, in addition to the plasma torch, SWI purchased an optional oxy-propane torch attachment, for cutting thick plate beyond the PAC-torch capabilities. Changeover to oxyfuel cutting takes just a minute or so. Santiago also highlights the PAC machine’s unique ability to clean-cut stainless steel from 1⁄8 to 11⁄8 in. thick, leaving a cut edge face free from oxidation. This results, say Komatsu officials, from the addition of propane to the process as a shielding gas, mixed into the nitrogen carrier gas. Komatsu calls this the QuickSilver process—during cutting, the propane breaks down to provide free hydrogen that prevents oxidation of the cut edge. 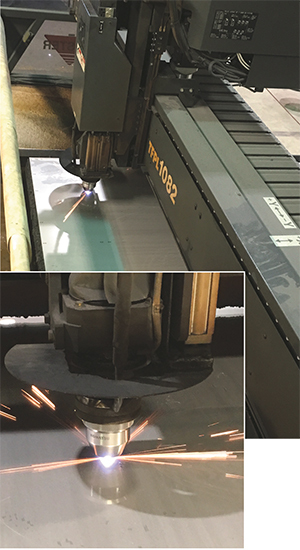 The upgrade from standard or traditional plasma cutting to the high-definition process results in a tightly shaped plasma arc to optimize energy density. The result is squarer, smoother cuts without compromising cutting speed or consumable life. Shown: 1⁄4-in. Inconel 625, plasma-cut with propane assist. “We accomplish this without having to use expensive pre-mixed plasma gas,” adds Corcoran, referring to the commonly used hydrogen-nitrogen blends available in gas cylinders. Instead, SAI delivers gas to the cutting machine via liquid cylinders of nitrogen, propane and oxygen—again, mixed at the cutting head. That process, as well as the cutting process, is managed by SigmaNest nesting software. It directs all scribing functions throughout the entire sheet nest, and then commands the machine to switch over to cutting mode. That seamless move from scribing to cutting occurs in seconds, again made optimally efficient since there’s minimal gas purging required. The process also benefits from state-of-the-art microprocessor-based control of cutting speed and torch height, power-supply parameters, and plasma- and assist-gas flow rate and pressure, all of which store in the machine’s control database. Automation is essential to ensuring high overall equipment effectiveness, so that operators need not spend a lot of time fine-tuning the machine. But, are there times when stored process parameters, primarily supplied upon installation of the machine by Komatsu, need to be tweaked? “Definitely,” says Santiago. Not to be overlooked, adds Corcoran, is the upgrade from standard or traditional plasma cutting to the high-definition process. Simply, high-definition cutting employs a specially designed cutting-head orifice that tightly shapes the plasma arc to optimize energy density. The result is squarer, smoother cuts without compromising cutting speed or consumable life.